Conservation biologist David Arakawa is measuring whether gene sequences are conserved or variable across a diverse set of avian species. He’ll be continuing his work as a graduate student this fall in the Tropical Conservation and Environmental Science program at UH Hilo. By Susan Enright. Photos by Elijah Owens. 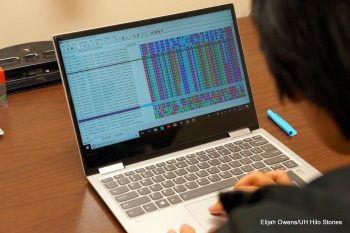 David Arakawa at work on the database that will aid the conservation biologist in measuring whether gene sequences are conserved or variable across a diverse set of avian species. Click photos to enlarge. 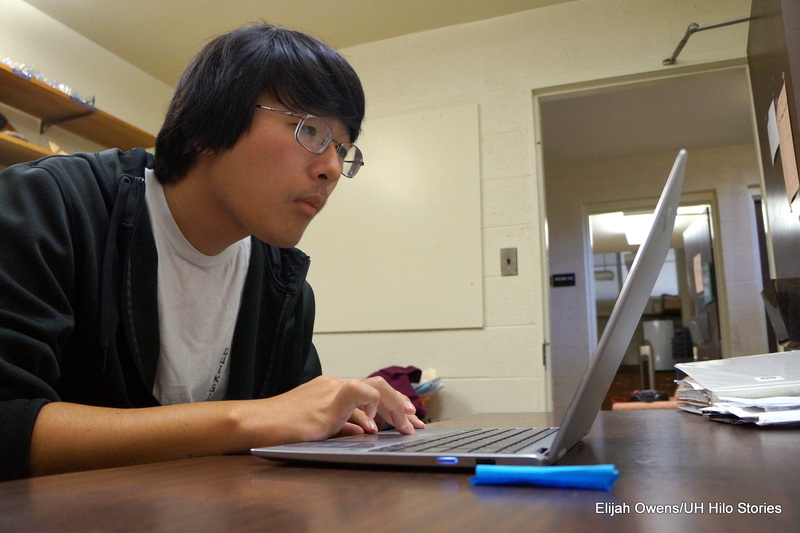 David Arakawa works on the genome database. Click photo to enlarge. 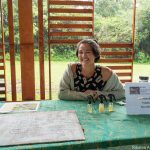 Genome research conducted by a recent graduate of the University of Hawai‘i at Hilo will lead to a better understanding of the unique evolution of the Hawaiian honeycreeper, a group of endemic and endangered birds found in the forests of Hawai‘i. 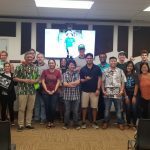 David Arakawa, who hails from O‘ahu and graduated from UH Hilo last fall with a bachelor of science in biology, began his research as an ‘Ike Wai Scholar in his senior year. 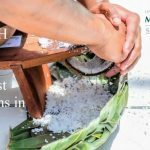 The scholar program is funded by the National Science Foundation; one of the purposes of the grant is to train up-and-coming conservation researchers in data science. Arakawa will be starting graduate school this fall in the UH Hilo Tropical Conservation Biology and Environmental Science program. Meanwhile, he is currently taking courses as a post-baccalaureate student while he continues his research to bridge the time between his fall 2017 graduation and fall 2018 entry into the graduate program. Adaptive Radiation Diagram, by H Douglas Pratt, published in the book, “The Hawaiian Honeycreepers: Drepanidinae,” Oxford University Press (2005). Click to enlarge. As an undergraduate, Arakawa surveyed peer reviewed literature to identify candidate genes associated with bird beak shapes and sizes called beak phenotypes. He identified 10 genes that have shown repeated associations with beak shapes and patterns, including length of beak and mandible development. 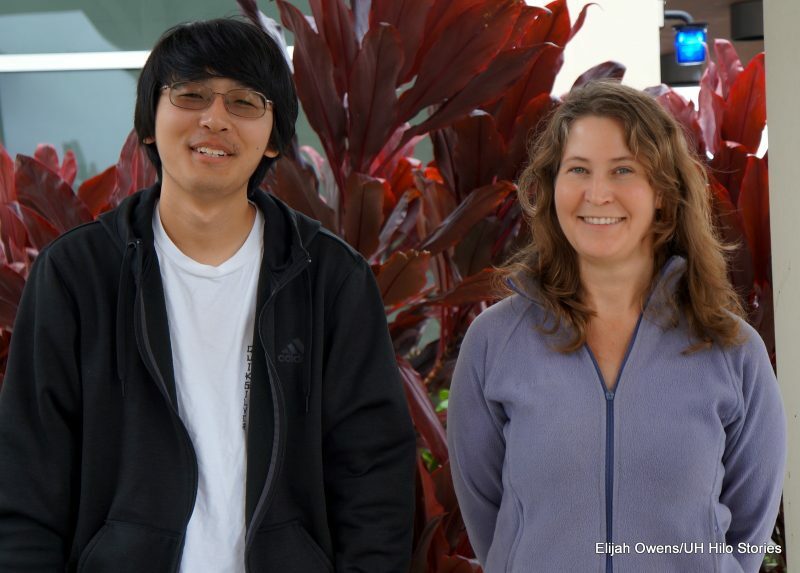 “David has a keen attention to detail and is thorough, two traits that are important when conducting research,” says Renee Bellinger, an adjunct assistant professor in the Department of Biology and a postdoctoral researcher with the Tropical Conservation and Environmental Sciences program and Arakawa’s mentor for his ‘Ike Wai Scholar work. 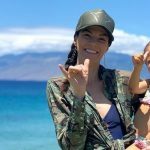 Bellinger’s area of expertise is in bioinformatics and genomics, and the research Arakawa is doing is related to her UH Hilo research program. “Gathering and tracking data must be carefully executed in order for that data to be beneficial to a project, and David is quite successful in both of those regards,” she says. David Arakawa and mentor Renee Bellinger. Following identification of the genes, Arakawa mined gene sequence data from the U.S. National Center for Biotechnology Information web-based repository to assess two scenarios: 1) the candidate gene is directly responsible for the phenotype, or 2) differences in gene expression are more likely to explain the phenotype. To make these assessments, Arakawa is now measuring whether gene sequences are conserved or variable across a diverse set of avian species. If gene divergence corresponds to broad-scale beak features, that would support the first scenario noted above. He will eventually use a standardized set of bird genomes to identify genomic regions that could be involved in each of the 10 gene’s regulation and expression. These findings can be used to make predictions about other genes that might be co-expressed with the 10 candidate genes. Endangered ‘i‘iwi in flight. This bird, one of several critically endangered members of the Hawaiian honeycreeper family, prefers native koa tree forests like those on Hakalau Forest National Wildlife Refuge, Hawai‘i Island. Photo by Donald Metzner. “Ultimately we want to identify suites genes that work as a team during beak growth and development, and apply these findings to better understand the Hawaiian honeycreeper adaptive radiation,” says Bellinger. Understanding the bird’s adaptive radiation, meaning the way the honeycreeper developed and evolved into different species in the isolated environment of Hawai‘i’s rain forests, is important for conservationists in their quest to understand better the remaining species. 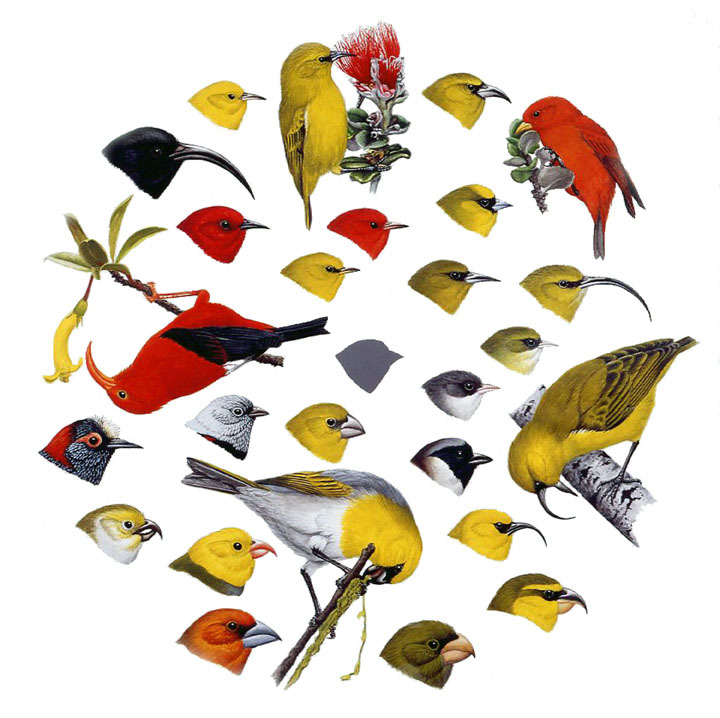 Bellinger says there are approximately 17 extant and nine extinct Hawaiian honeycreepers. 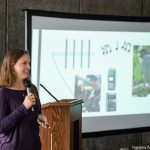 Numbers tend to vary, she explains, because the birds are lumped or split out into different species or sub-species depending on decisions made by the American Ornithologists’ Union Committee. Arakawa and other ‘Ike Wai Scholars from the current year will present their research findings at a poster session to be held at the end of the spring semester, which marks the conclusion of the 2017-2018 scholars program. A new cohort of scholars will be named for the coming school year. Arakawa will start graduate school this fall with the UH Hilo Tropical Conservation Biology and Environmental Science program. After he has finished his master of science degree, he would like to find employment in the field of conservation biology. Photographer Elijah Owens (sophomore, geology) is an intern in the Office of the Chancellor.